PezCycling News - What's Cool In Road Cycling : PEZ Roadside: Ale’s Road To Sanremo! 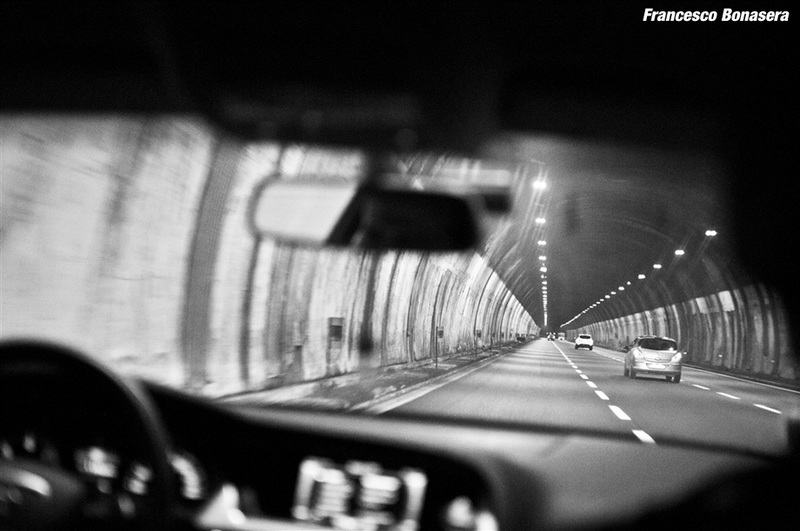 PEZ Roadside: Ale’s Road To Sanremo! Read the PEZ 2019 Milan-Sanremo Preview HERE. It is a very special race. Maybe few are able to describe the reason why it is, but definitively you can’t find anything else similar in the calendar. The race is able to maintain its charm despite more than 100 years of history, and despite that cycling has evolved a lot since then; the roads were unpaved and going from Milano to Sanremo was really for heroes (or the desperate, as you prefer). Coming closer to the event we (the media) will try to convince you how important this race is. 300 kilometers long and it’s the first of the 'Monument' Classics. Everything correct, but not enough to explain what is the core of this race. So, we bring you with us inside and behind the scenes. 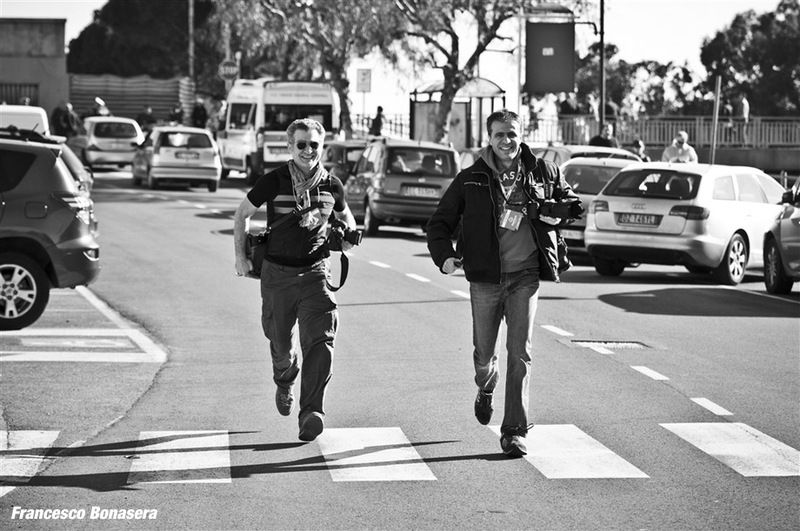 Sanremo is not just a race, it’s a voyage that changes you. 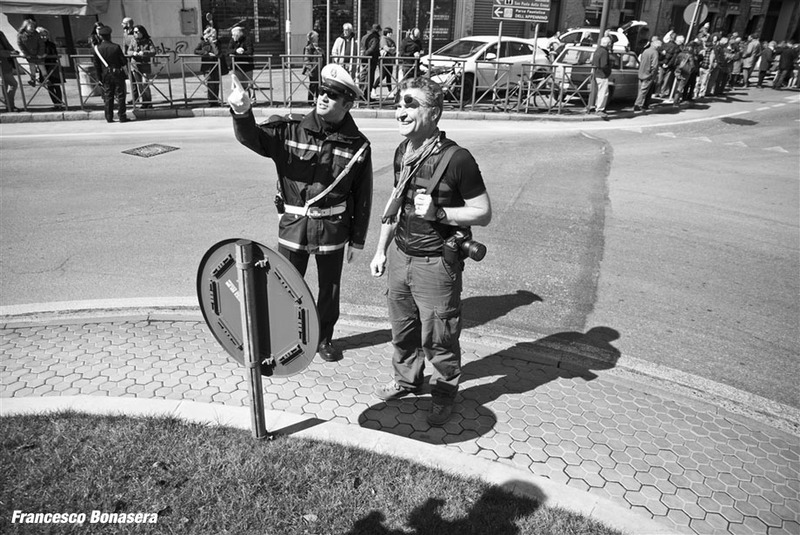 This is the story of our chase of Milano Sanremo 2016. 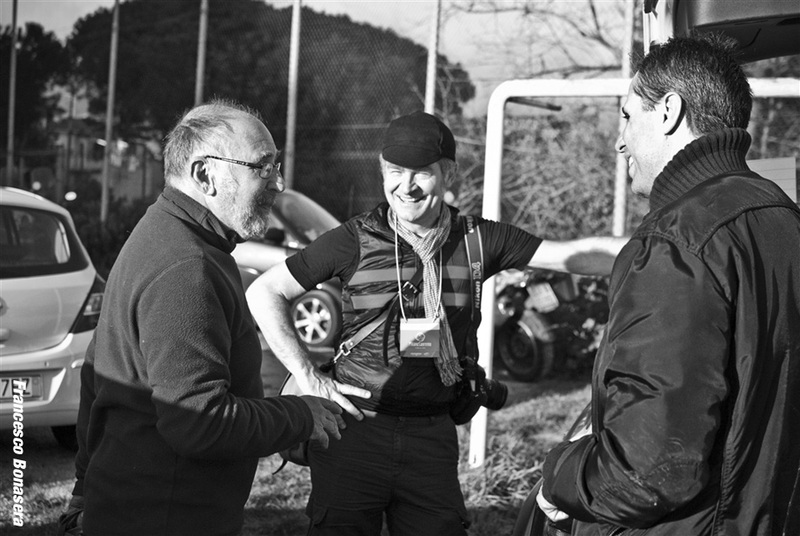 Me, Francesco Bonasera and Angelo Giangragorio; three friends with a passion for cycling photo journalism and web based tales. You can find our work at www.albumciclismo.blogspot.com. The morning; if you are not in Milano, but somewhere else, you can’t feel how cold the first hour is on the road, while waiting for the riders down at the buses. The sun may shine or not, but it’s cold and time seems to go slow till the first team decide to ride to the podium. From that moment ahead everything becomes very fast. You try to watch and shoot a rider, but another one passes fast behind you, you run to a team and another one has already left. 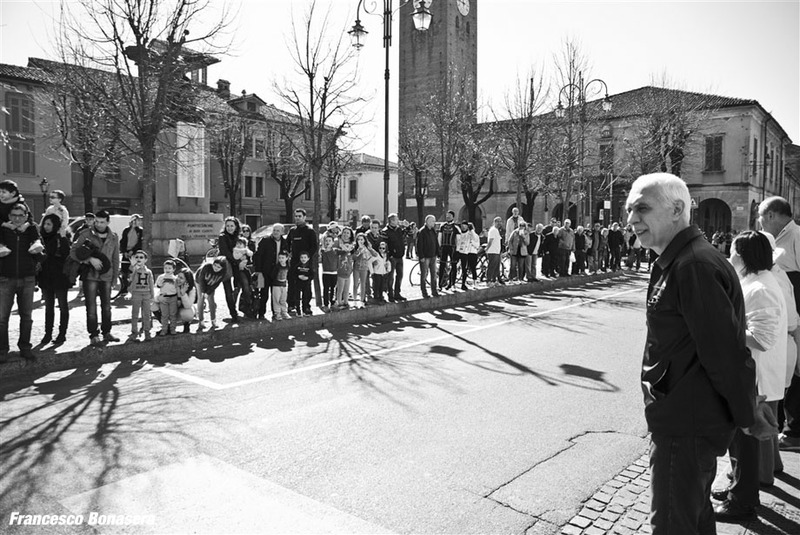 Despite the number of the races that you have chased before, the morning of Milano Sanremo it’s always like the first school-day. 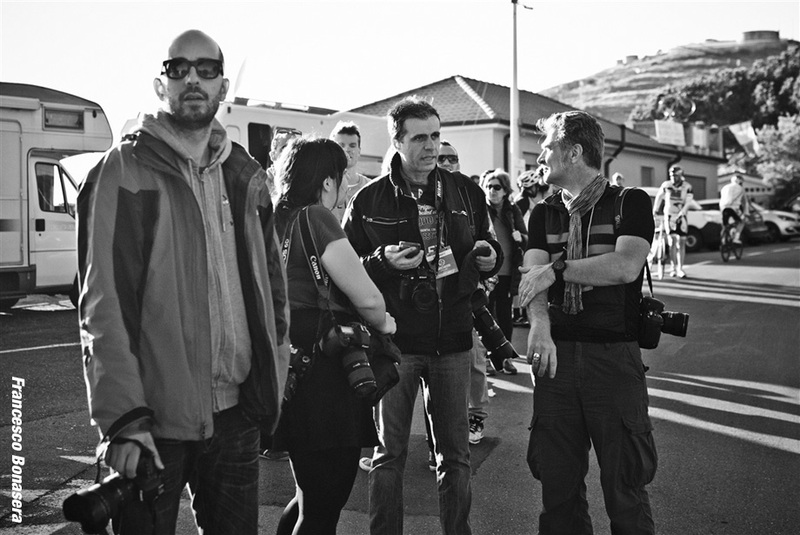 You meet colleagues, you meet people you saw the year before, or during the last Giro. You have to be there to feel the excitement and watch all these great champions who are also excited and nervous. For what? It’s a race, yes, but they also know it’s going to be special. It’s going to change a career. A fast look to the watch, setting the GPS, check the plan for the last time and you know nothing will go according to it, it’s the first school-day and everybody except you seems to know what to do, but in fact, nobody really knows. Ready? Go! From Milano to Ovada there are 120 kilometers and less than 3 hours of racing, but it seems to be the longest part. The flat is wide and the race passes through cities and small towns. We divided into two teams. Angelo and Francesco watching until the departure in Milano and I moved a bit further up the course to watch the first move of the day just outside Milano. Meeting point was Pontecurone, in Piemonte region. A small town with a long narrow road through the houses and one square. Last year the weather was perfect and we can enjoy the waiting time. 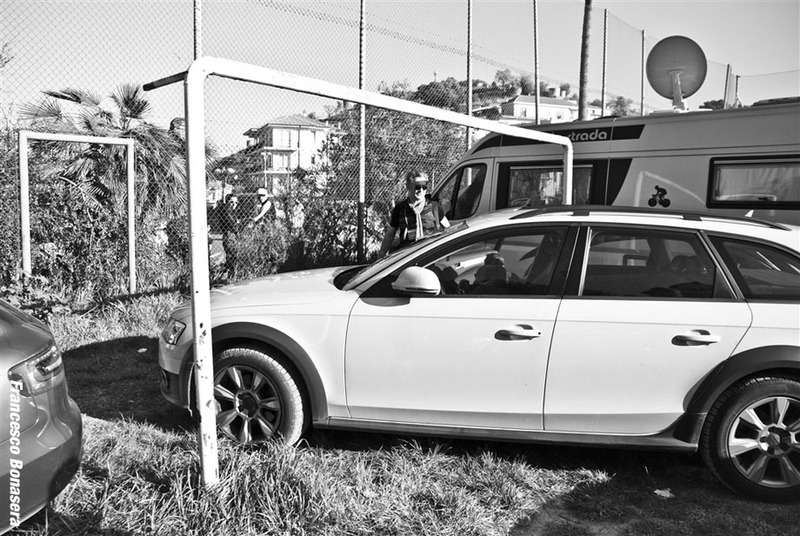 We have had years when being outside the car was a true pain. From this point of the race onwards we drove together, in the same car. When we came to Ovada (the gate to the Apennines) it was lunchtime and we could smell the agnolotti aroma coming from the houses. Blossoming cherry trees all around, everything was fine till the point when we realized the race was being deviated into the highway because of a landslide on the coarse road. 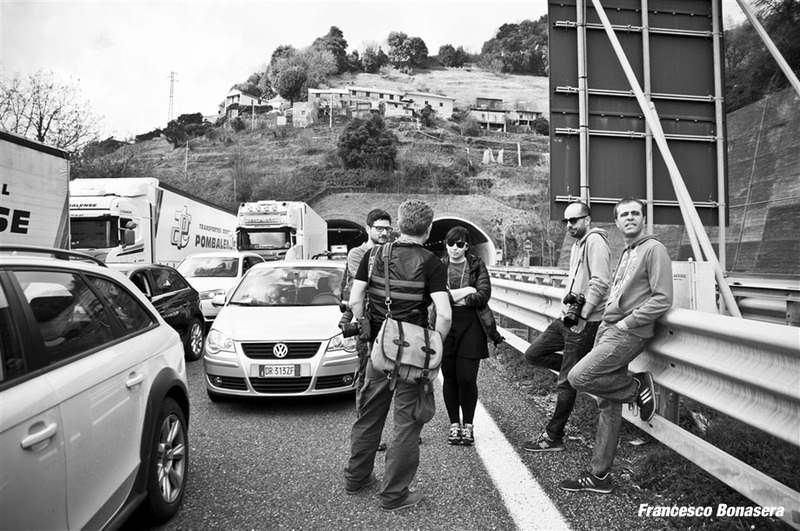 No other option than let the race pass and hope the autostrada (highway) was going to open fast behind it. It was not so fast and it took twenty minutes of waiting with the thought to the Poggio and the lost chances. We didn’t really panic but we were quite frustrated. 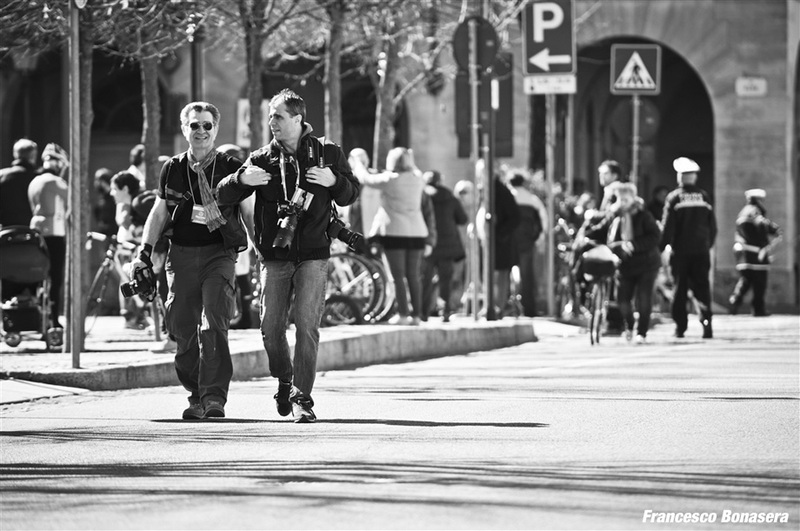 Luckily we were not alone as other photographers and journos were also forced to wait the opening. However, when we started to drive again the traffic was smooth and we were able to meet the race on the coast. No plan and not a big change in the end. The last 100 kilometers of the race allows you just a couple of passages more. The Poggio is a dream, it’s right at the end of the story, but you have to get there hoping no other incidents, or whatever, mess it up. But going directly to the Poggio without intermediate stops, would mean missing the real charm of the race which is to pass through the coast, through the towns, through the people and change at any angle. What we love is to watch all these people, all these passages and appreciate the small changes. Now the Lotto Team chase, now it’s the Giant. The time passes but you don’t realize it properly. When we get to the Poggio the race is about to arrive. All the car parks are full and you can’t find anywhere off the race route. It’s always warm over there. Even during the bad weather it’s warmer than anywhere else. The cold of the morning in Milano has been forgotten and you realize that you’re surrounded by flowers and water. The sea is on the left and on the right as well as in front of you. The light is nearing the sunset but it’s still strong. 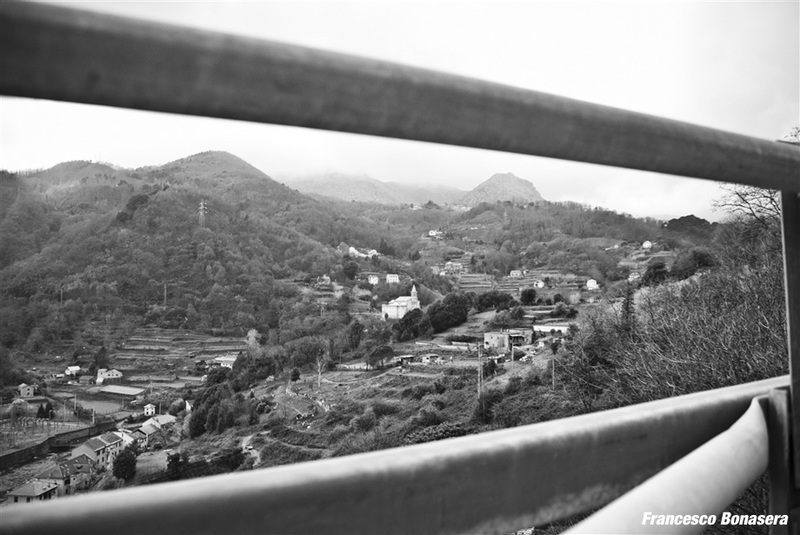 When you land on the Poggio climb you feel you have come to another dimension; the excitement is at its highest. Race motos and cars pass fast like the race is just behind but the race never comes. Seconds become minutes and finally the head of the race pass. Too fast. You would like it to be claim for a little longer, but you know it’s over. 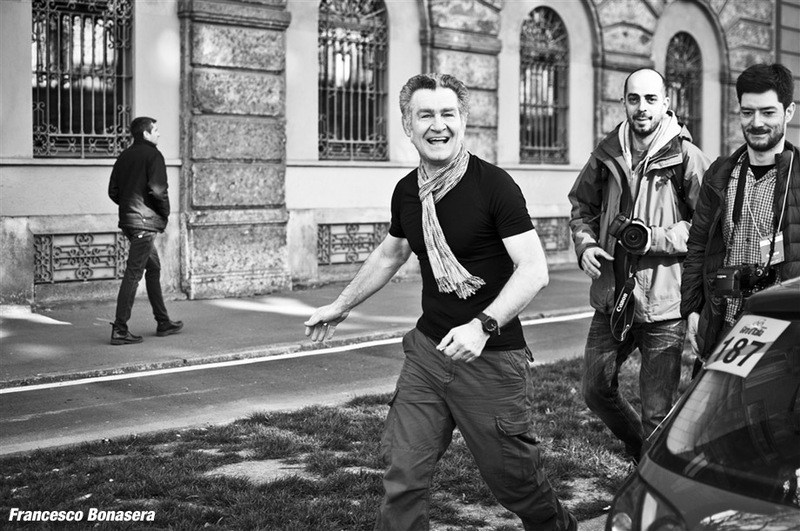 When we got back to the car one guy stopped us, asking me if I’m that Ale the blogger – “yes I am” – I replied. In short, Colin (his name) is a cycling enthusiast traveling the whole of Europe in a camper, following races and reading my pieces on the web. I believe this was the biggest emotion ever in my 'journo career' and I’m still in touch with Colin and meeting him here and there on the road. Something you can’t see, but it’s an important part of the adventure is the job that starts just after the race, made up of picture editing, text messages, race talks and comments... and driving. The way back home is long and we will see our beds well after midnight. The camera is full of pictures, but few will be able to describe our day. 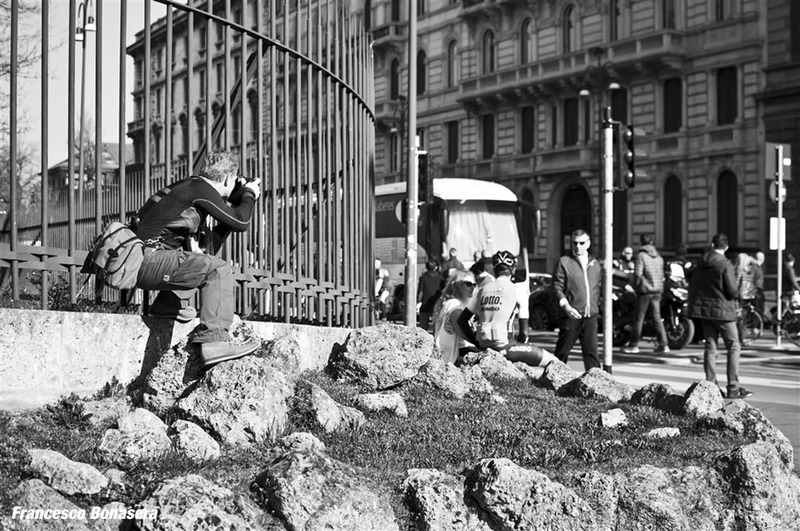 Now, reviewing them back the best I could find are the ones posted with this story and shot by Francesco (https://www.flickr.com/photos/francescob82/), telling nothing about the race but everything about us. Colin is the best I could ask for on the day. The first follower I've met in person, ever! The race is over but our day is still very long. We have to organize the job, to understand what really happened in the race (that we actually didn’t see!) and travel safely back home!